Google's new Two-Step Verification feature, if enable requires authorised Android phone to be physically present near the computer or the devices to unlock Gmail or G suite of apps. 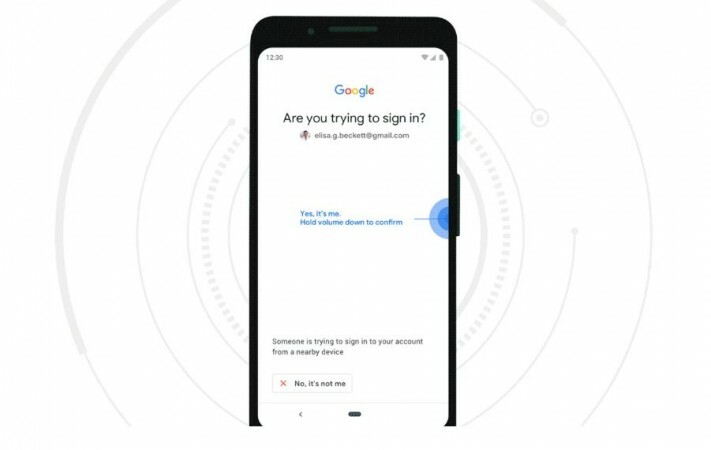 Search engine giant Google announced a new Two-Step-Verification (2SV) feature that literally turns any Android phone running v7.0 or later into a physical security key. It is a step up from current 2WA version, which the user would be able to login into their email account by typing in the code, sent to their phone via SMS. But, it's not fool-proof; street-smart hackers, several times in the recent past, have hoodwinked gullible users to give away the code and take over the emails or even syphon of their hard earned money in the bank accounts. Now, Google's new Fast IDentity Online (FIDO) 2.0 certified 2SV feature is more secure than ever before, as users will be able to unlock their Gmail or select G suite of apps only when their Android phone is physically near to the computer and he/she clicks the unlock button in the former. Prerequisite: To activate your phone's built-in security key, you need an Android 7.0+ phone and a Bluetooth-enabled Chrome OS, macOS X or Windows 10 computer with a Chrome browser. Turn on 2-Step Verification and add a verification method like Google Prompts. Under "Signing in to Google," select 2-Step Verification. You might need to sign in. Scroll down to "Set up an alternative second step." Select Add Security Key and then Your Android phone and then Turn on. On your Android phone, double-tap the "Are you trying to sign in?" notification. Follow the instructions to confirm it's you signing in. This will definitely come handy to protect the devices from unauthorised access and also avoid several phishing scams online. "This makes it easier and more convenient for you to unlock this powerful protection, without having to carry around additional security keys. Use it to protect your personal Google Account, as well as your Google Cloud Accounts at work. We also recommend it for people in our Advanced Protection Program—like journalists, activists, business leaders and political campaign teams who are most at risk of targeted online attacks," Google said. In a related development, Google is reportedly planning to bring the new mid-range Pixel 3a (& 3a XL) series particularly for emerging markets such as India. The Pixel 3a and the Pixel 3a XL is expected to cost around $300 (approx. €267/Rs 20,884) and $350 (around €/312/Rs 24,364), respectively. The Pixel 3a is said to sport a 5.6-inch OLED screen with a 2220x1080p resolution having 440 ppi (pixels per inch) display density. Under-the-hood, it is expected to ship with Qualcomm Snapdragon 670 chipset with 4GB RAM and a 3,000mAh battery, which is enough to keep the phone running for a full day under mixed usage. On the other hand, Pixel 3a XL is coming with, except for the fact that it will sport a 6.0-inch OLED display with 2160x108p resolution and 4GB RAM. Both the upcoming Google phones are likely to run Android 9 Pie OS software.